Yup, I still live and plan to redo the whole website real soon, watch this space. It's not all doom and gloom, thanks to the marvelous bazzfish I now own a Zaccaria Puckman from Italy. A real sweet looking purple cabinet with some bizarre artwork. Go check it out in the cabinets section and expect lots of artwork online soon. So far I have mannaged to scan the entire bezel, marqee and control panel overlay. 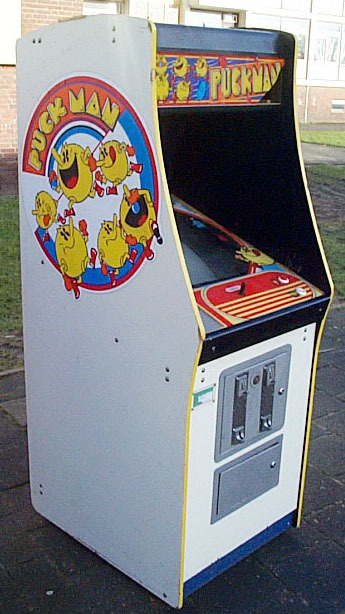 I just bought two new Puckman cabs, one unknown Namco style cab you can see [here] and a NSM wallmounted Puckman cab, pictures as soon as I get it over from Germany. Since it has been such a long time that I worked on the site I decided to go trough all pages and do some HTML tyding up, I hope you like the result. How dedicated can one be to a hobby? Go check out my new Puckman tattoo [here]. Yup, it is true, I found a new type of Puckman cab on [ebay]. I am emailing with the owner and he has suplied photos, expect them online soon! For now I have added an entry to the cab list [here]. So, if you own a Puckman arcade game and would like to showcase it [here] then [email] me. I now found a flyer for [Puckman Pockiman] and made some screenshots. Remember that [Puckman Pockiman] game I talked about before? Well, I tracked one down and bought it :) Expect more info on said page real soon! A sad day indeed. 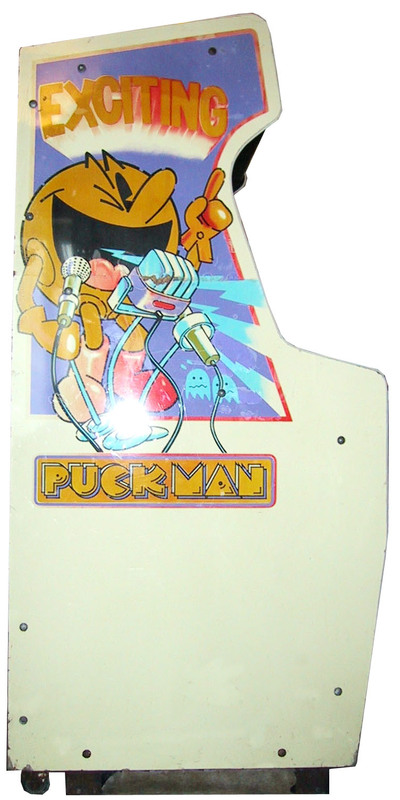 Because I really needed the money and the space I had to sell my Puckman upright :( I hope that [Arcade Warehouse] will find a good home for it. Today I got a new Puckman cocktail from a friend up north (everything north of London is up north). Needs plenty of work, expect pictures soon. Some company called Genie (anyone more info) has made this Puckman Pokimon duo game.. Check it out [here]. I still have no memory for my 8500 so cant do the video capture at the resolution I want. To give you a taster I have decided to crab some stills at the resolution I wanted. Check them out [here]. Its confirmed, Toru Iwatani still eats pizza! Check it out [here]. As soon as I get some more memory for my PowerMac 8500AV I will digitize the entire interview in a much larger resolution. I found this program that can convert an image to ASCI, check out what I did [here]. Added a recipe for a Pacman cocktail that I found on a cocktail database site, check it out [here]. I used my works digital camerca to take a new photo of my Kenphone Puckman cab, check it out [here]. I found this very funny site that keeps track of the English blunders the Japanese make in daily life, go check it out [here]. After 2 years of sending emails and snailmails to Namco Ltd Japan they have finally decided to be so polite to write me back. Asking if I have acquired the right's to place Puckman material online. Now I have been in contact with Namco US and UK for some time and they both like my site, even more, they think that fan sites are a compliment to what they do. Feel free to [email] me with your thoughts on the matter. Would have been nice if they had send me an email, but thanks anyways. [click here] to visit the site. This is the stuff they wrote, just in case they remove it from their site. With the help of Altavista's BabelFish you can now view my page in several other languages, well sort of anyways. [click here] and then select to whatever you would like to translate it. Namco Ltd Japan released a new Pacman game called Pac'n Party. It's a shooting gallery type of game and features colourfull graphics that would make Puckman proud. Go check it out [here]. I found out today that when clicking on the high res links in the artwork section it will only show you half of the images. Instead right click or hold click to download the high res file to your desktop. I know this is not direct Puckman related but I created control panels artwork for a Pacman cocktail. If you would like these please [email] me. They are in Adobe Illustrator format but can be converted to any other image format. I have added the artwork section, changed Namco to Namco Ltd and added a page linking to all Namco sites. If you have any comments please [email] me. I finaly made the time to sit down and work on my Puckman site and I'm rather pleased with the way it worked out. If you have any comments please [email] me. Jonathan Thompson from Retro Arcade Machines delivered my Puckman upright from Kenphono Electronics. A well done bootleg with artwork that is 99% accurate to the Namco original. If you have any more info on the origins of this machine please [email] me. I have set up a Puckman mailing list on Yahoo Groups so all us Puckman nutters can exhange mails. You can [click here] to join us.